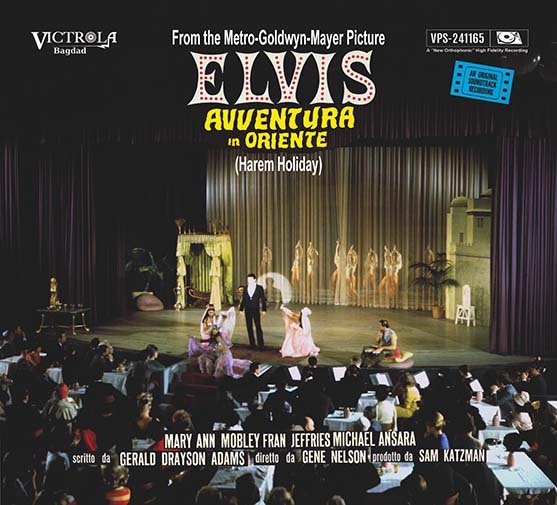 Victrola label is proud to present an ultimate release of Elvis’ ''HARUM SCARUM' movie soundtrack material. What makes this new release so special? Most of it has been released before, but never before in such pristine quality! The outtakes come from a direct copy of a DAT cassette that was made on November 1989 in New York City. It was a surprise to discover masters that we had not heard in the way before. On this DAT copy there were also other outtakes from other studio sessions. Most of these outtakes have been released before but never before have they been heard in stereo. The special feature of the Harum Scarum sessions is that the songs were recorded with two drummers that can also be heard simultaneously, this is clearly audible in the sessions. The mono masters come from the first English pressing of the UK LP Harem Holiday. What you hear is the authentic sound that was on the LP. - Crying In the Chapel: was issued on April 6, 1965, in RCA's 'Gold Standard Series'. It became Elvis' first million seller (!) since 'Return To Sender' in 1962 and his greatest chart success over a six-year span. - (Such An) Easy Question: was released as a single on June 8, 1965. It was the follow-up release to 'Crying In The Chapel' and peaked at number 11 on the US Billboard Hot 100. The single reached the top of the Billboard Easy Listening Chart, spending two weeks at number one in July 1965. The song was also included on the soundtrack for the movie 'Tickle Me', released on June 3, 1965. Do not miss your opportunity to obtain an ultimate “Harum Scarum” release from renowned Victrola label!